That disappear when she smiles. But God, You know, that this is what I’m aching for. God, you know, I just can’t see beyond the door. With these agonizing words starts perhaps the greatest work of tested faith that I have ever heard. When I discovered that Steven Curtis Chapman and his wife, Mary Beth, lost their daughter on May 21, 2008, I was saddened. When I found it was an accident in their driveway where she was hit by a vehicle driven by their Will, I was horrified. How will their family, their happiness and their faith ever return to normal? Will there ever be peace in their hearts again? “beauty will rise” goes a long way to answering those questions and unveiling more. Chapman initially pondered leaving the music business entirely in the wake of the loss of his daughter, Maria Sue. Ironically, he perhaps found his true voice with this album, which helps to give some gravity to the words of faith he’s let flow from his lips over the years. I am not saying he lacked any substance. Rather, he came to me as just a pop artist who sang about God to me before this album. Reviewing this work was extremely difficult for me. I had the hardest time making it through, as each song brought for me an onslaught of tears. The tears are not as much for his beautiful little girl. She seems the most confident of her role in the whole family. She was a wonderful, happy, and faithful girl who loved her family and loved Jesus. Ironically, with her death, she seemingly avoids the hardest part of living: surviving. “Oh God, I know, it’s so much more than I can dream. It’s far beyond anything I can conceive. The chorus surges into open air. In the depths of their despair, their instincts tell them that it is always darkest before the dawn. It seems like a cliche, but at times like this, imagined light at the end of the tunnel will suffice. That is until God pushes the Earth back into sunlight. 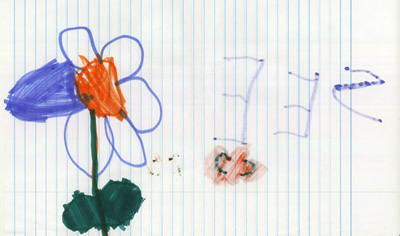 “SEE” is an amazing story of the Chapmans’ discovery of a piece of artwork that Maria made, likely on the day of her passage. On one side, a flower with six petals. Only one of them colored in. There are six Chapman children. 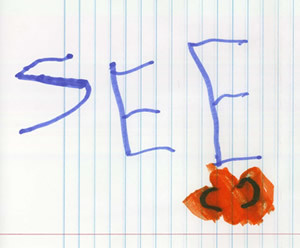 The flip-side had scrawled the word “SEE” in her handwriting. This is a word they did not know that she knew. This discovery carries much significance and some hope at a crucial time in their journey. The song “Faithful” has that feeling of a torchlight worship ballad that would have been a hit in the Christian scene of the ’90’s. Here, of course, it has much more significance. Every word is labored as the pain behind it shows a man who has reached the darkest part of night in his heart. In the end, Chapman clings to the belief because in God as he expresses “…For the sake of love You hung Your own Son on the cross to die…” and if God can sacrifice his own Son to the cause, how can he not be faithful? An honest and open dialog between Chapman and his wife during their first Spring Break after Maria’s passing lead to the heartbreaking “Our God Is In Control.” I honestly don’t know how he got through this song. “This is not how it should be / This is not how it could be / But this is how it is / And our God is in control…” The song is more is a meditation than anything. A repetition. It brings to mind the story of Tina Turner, “What’s Love Got To Do With It?” when she decided on a mantra, and just went with it. Belief came along for the ride, even if it was looking out the window sullenly at first. “…This first taste is bitter / There will be sweetness forever / When we finally taste and SEE…” In the end, they all will arrive at the Light. “February 20th” is a song of thankfulness and delight. Sparingly sung over a piano and cello, Chapman describes the joy Maria felt as she became aware and believed in Jesus. He clings to her faith here as he does through the rest of the album. She provides the Lighthouse of faith, allowing them all to SEE in their darkest hour. “I Will Trust You” seems a tenuous response to “God Is It True…” as this time the mantra comes as a direct response to the despair he is feeling. “…I don’t even want to be right now / I don’t want to think another thought…” shows, unwittingly, the curse that we all succumb to in eating from the tree of knowledge. With the freedom of will and the gift of intellect, we actually pushed ourselves away from the truth of God. Such is the burden revealed. With faith and trust, we are freed from our worst demons. Just to get there, we must go through this life carrying the memory of our losses and the mystery of the future. Once we reach “Jesus Will Meet You There,” Chapman has all but surrendered to his grief. He throws up his hands and acknowledges he is wounded, almost mortally, before the Lord. Something tells him, even in these moments, he is not abandoned. The album fades out with a gently lulling song, inspired by the pastor of Maria’s funeral service, called “Spring Is Coming.” In having “planted the seed while the tears of our grief soaked the ground,” Chapman holds tight to the thought that while they are suffering “beneath the ice and snow,” their grief, like her body, will take root and life will start anew. “…And my heart is heavy now,” Chapman sings, with burgeoning triumph in his quiet voice, “but I’m not letting go / Of this hope I have that tells me / Spring is coming…” Hope is in conjunction with faith now, with the latter dependent upon the former. Sometimes that is all you have, when your heart and brain, don’t have proof to feed them. This most honest assessment of one’s faith I have encountered, has bolstered my own. 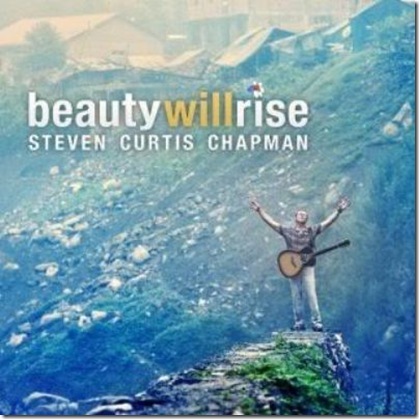 In revealing his weakness in his darkest night, Steven Curtis Chapman has provided a jolt to my own faith. Christians who debate the authenticity of their faith with the non-believers are often wasting their time. The answer will never come from those who don’t know how to question.